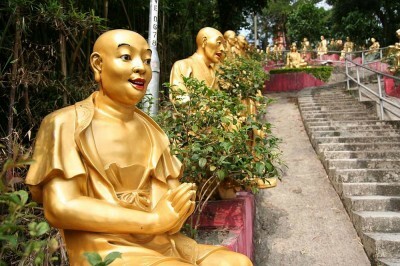 Ten Thousand Buddhas Monastery is a grouping of Buddhist structures founded by Buddhist monk Yuet Kai in the year 1947. It is one of the most popular tourist attractions and sites of pilgrimage in Hong Kong. The temple located on the hillside behind Pa Tau village in the Sha Tin is very unusual. It has a hundreds of life-sized Buddha statues in addition to 10,000 miniature Buddha statues. Ten Thousand Buddhas monastery is not a single Buddhist temple, but consists of 5 temples, a pagoda, 4 pavilions and a veranda. The monastery occupies a space of more than 19.5 acres and is divided into upper and lower portions. Visitors are required to walk more than 430 steps uphill to reach the monastery. Ten Thousand Buddha temple, which is the main monastery, consists of about 12,800 pieces of exquisite Buddha statues. Each statue is placed on the wall in a different posture. Also, the immortal body of the founder, Yuet kai, is placed in the middle portion of the hall for people to worship him. Opposite to the main Buddha temple is the 9 story pagoda which visitors can ascend through an internal staircase. The Kwan Yam Pavilion is located between the temple and the pagoda, and on both sides of the veranda the 18 Arhans are placed. The upper portion of the monastery consists of the other 4 temples. They are the Temple of the god of heaven, the kwan Yam temple, the Candi Buddha temple, and the temple of the Nei Tor Buddha. Take MTR to Sha Tin station, and leave the station through exit B. There will be directional signs that point towards the monastery. The monastery is open every day from 9 AM to 5:30 PM.